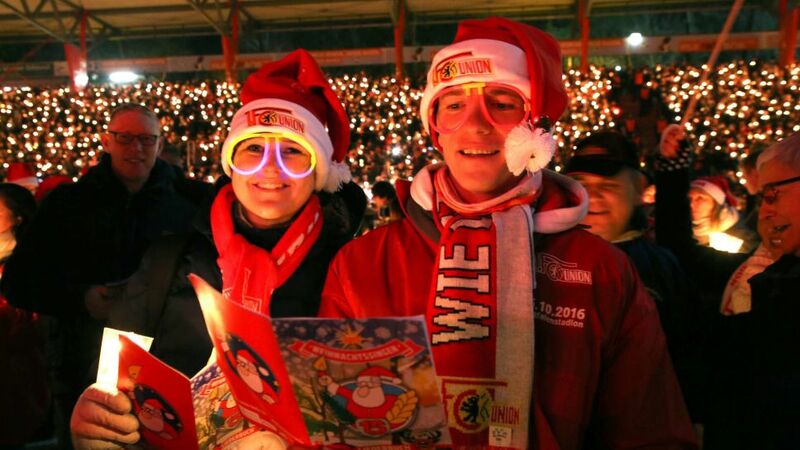 It just wouldn’t be Christmas without the now annual tradition of carols by candelight at German second division club Union Berlin’s An der Alten Foersterei Stadium. The ground, located in the neighbourhood of Köpenick in the German capital, fills to capacity on the last night before Germans celebrate Christmas with the masses warming the cold night air with festive songs. The event – which has been mimicked by several other clubs – originally began when a group of dissatisfied Union fans broke into the stadium and started a mini concert to cheer themselves up ahead of the festive period. Incredibly, since that night in 2003, the event snowballed into the huge occasion it is today, with close to 30,000 people filling the Berlin-based stadium each year. Music is provided by a school choir while several of the event organisers bring musical instruments to accompany the carols. And the most popular carol? O Tannenbaum – or, O Christmas Tree – ranks particularly highly among friends, families and Union fans.